Add noticeable gloss and protection to your paint! One coat lasts up to 6 months! 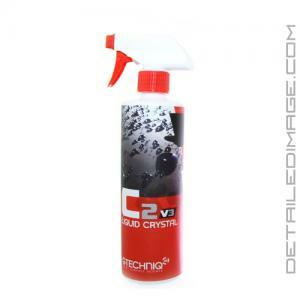 Gtechniq C2 Version 3 (v3) Liquid Crystal will add gloss and protection to your paint in an easy to use spray on formula! C2 v3 is a high gloss spray-on coating that will blanket your vehicle in a highly reflective, glass-like finish. This coating is built around the same monomolecular (SI14) technology as the popular C1 Crystal Lacquer, so you know you are receiving great protection with this product! Simply spray the surface with a thin coating and buff away with a clean microfiber towel and minimal effort! You can even apply C2 v3 to all exterior surfaces (i.e. paint, glass, chrome, plastic trim, etc.) to provide excellent UV protection, water-sheeting and dirt repellency. You can apply multiple coats of C2 v3, however just one application will last up to 6 months! Grab a bottle of the C2 v3 Liquid Crystal today and apply a great deal of gloss and protection with ease! C2 Liquid Crystal is the revolutionary way to make your car, yacht, aircraft or RV shine and stay clean longer, thanks to the unique 3S Smart Surface Science. With C2 Liquid Crystal you get instant, effective protection from UV and dirt without the expense of dealer applied systems. Fast and easy to use, C2 is based on the same smart surface technology as its big brother, C1 Crystal Lacquer which is the performance coating of choice amongst industry professionals and OEMs. A Single application will offer up to 8 months protection. C2 can be used with any other car care products as a base or top layer. Great product, I use it everytime I wax and every once in a while after wash. I even use it to help my calibers stay cleaner longer and it works great. I liked it very much. Just wish it was a bit cheaper..